These Mexican cities, states, and regions have unique cooking styles, recipes, or ingredients to offer. Acapulco: This resort community has been a popular vacation destination for many years. You will find most of the menus have very traditional dishes, such as posole and enchiladas. What is unique about this city is not the actual food, but how it is served. Most restaurants feature dining al fresco, or outdoor dining. The climate is warm all year long, allowing diners to enjoy their meals with spectacular views of the beaches and sunsets. Los Cabos: Cabo San Lucas is located at the southern tip of Baja California and features fresh seafood all year round. The fishermen leave before sunrise and spend hours capturing the freshest fish and shellfish around. Cabo is also where the fish taco became famous, and you can find many different versions in just about any restaurant. Durango: This state is located in the northern area of Mexico. A common dish is barbacoa, which is a traditional dish of various meats steamed underground in a pit over coals. A signature dish from the area is venado asado, a venison dish. Other unique offerings include machaca, which is a dried meat, and pitaya, a native fruit. A sweet fruit paste called ate (pronounced AH-tay) is also from Durango. Jalisco: The region is known worldwide for its production of high-quality tequila, as well as the sauce covered sandwich called tortas ahogadas. The traditional dish of birria is also native to Jalisco. This pulled meat is often made of goat or mutton and is served as a stew or taco filling. You can find it at street stands, wedding meals, and brunches (where it is considered a hangover cure). Sinaloa: This long, narrow state is on the coast of the Pacific, at the mouth of the Sea of Cortez. One of the areas signature dishes is chilorio, which is pork in a chile sauce, and campechana sinaloense, a cocktail of fresh seafood. Being a coastal state, fresh seafood is easy to come by and is featured in many local dishes. Puebla: This is the original birthplace of mole, a sauce made from 30 ingredients including cocoa and peanut butter. Mole is generally served over chicken, though the chicken can be cooked in the sauce. Another famous dish from the Puebla region is chile en nogada, which consists of green chiles topped with a walnut sauce and pomegranate seeds. The beverage rompope was developed by the nuns of Puebla many years ago. The sweet potato dish camote is also traditional. Oaxaca: This state is located in southern Mexico and features varied cuisines. Mole is a staple here and is traditionally made with bananas and served with blandas (tortillas). On the Isthmus of Tehuantepec, tamales are made with iguana meat. Corn dough is used in many forms for empanadas and entomatadas. People from Oaxaca also enjoy chapulines, or grasshoppers, either in their tacos or as a snack. Most of all, Oaxaca is probably known best for its chocolate, which is made with cinnamon, nuts and other ingredients and is considered the best chocolate in Mexico. Tabasco: This state uses pre-Columbian ingredients to make its traditional dishes with freshwater fish and seafood. Yucatan Peninsula: Currently, the menus in the Yucatan are notable for their influences from Asian and Arabic cuisine. You will also find a lot of native Mayan ingredients such as chaya, achiote, hard-boiled eggs, turkey, deer, and honey. Some examples of Yucatan cuisine include poc chuc, a pork dish with achiote and sour orange; chiltomate, a sauce made with roasted tomatoes, chiles and onions; and papadzules, which are rolled tortillas stuffed with hard-boiled eggs and topped with a squash seed sauce and a tomato sauce. Baja California Peninsula: This region of Mexico is where the Caesar salad was born. This area also has a lot of Spanish influenced food and is known for its paella, made with fresh seafood. Baja California is also Mexico's primary wine-growing region, including Santo Tomas, San Antonio, and San Vicente. You'll find the city of Los Cabos on the Baja Peninsula, which is where fish tacos became famous. Northern Mexico: The traditional dishes of northern Mexico are likely ones you already know. Items such as large flour tortillas and beef are readily used in this area, where burritos are popular. Refried pinto beans are a popular side dish, as well as Spanish rice. Dried meat is also common to this area. 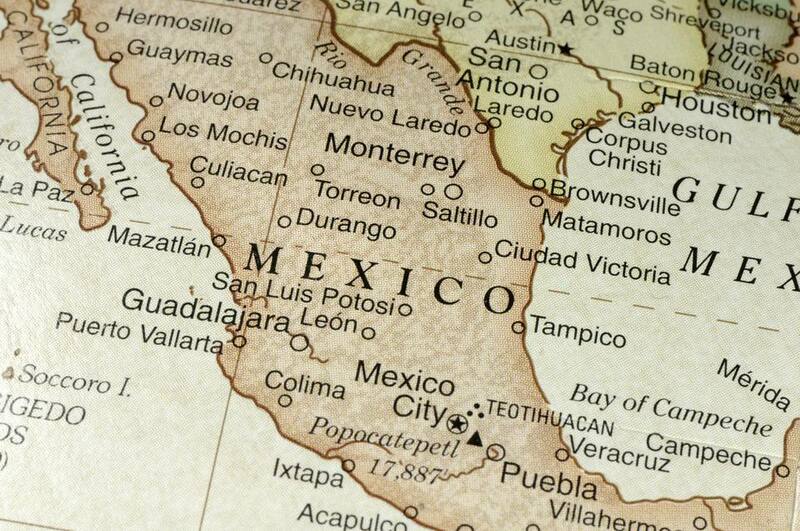 Southern Mexico: While northern Mexico favors beef as its main meat, the south prefers chicken. Corn tortillas are a staple to this area and are served at almost every meal. Black beans and plantains are also typical ingredients. Are Crunchy Tacos Actually From Mexico? How Is Piloncillo Used in Authentic Mexican Recipes?